Anyone who buys Disney music regularly on iTunes inevitably comes across Ukulele Ike Sings Again. For some reason or another I never paid this record any attention, ignoring it plainly as another random wishy-washy Disney release. 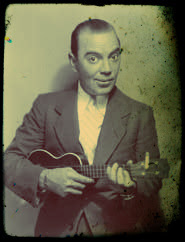 It wasn't until I was recently gallivanting across Youtube watching vaudeville stars that I really delved into the wonderful world of Ukulele Ike. Ike, whose real name was Cliff Edwards is most notable to Disney fans as the voice of Jiminy Cricket from Disney's second animated classic Pinocchio. Though this work is the high water mark for Ike's fame it does him an injustice looking solely at his voice acting. Before his work with Disney, Ukulele Ike was a huge vaudeville star performing in his wonderful high pitched and smooth voice along with his namesake ukulele. He performed everything from jazz standards to novelty tunes...as well as composing some of the most charming songs of the era. It's Only A Paper Moon. This is one of my favorites. Though talented and praised from a young age, Ike was unable to manage his fortune and filed bankruptcy several times (even after his Disney work) and suffered from addiction until his death in 1971. His recording of When You Wish Upon A Star is perhaps the pinnacle of Disney related music, emoting hope and whimsy in a way that only he could. This music is fantastic... and the story is really quite sad.